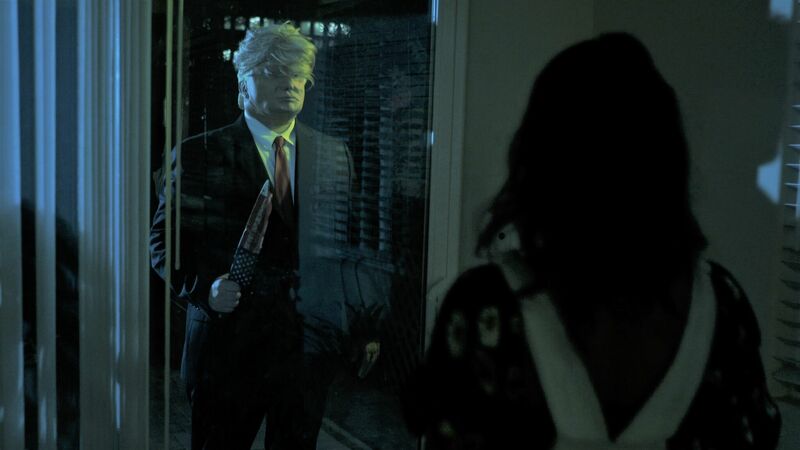 The pitch must have been a fairly simple one: hey, why don’t we make a spoof of the original Halloween where instead of a Captain Kirk mask, the killer wears a Donald Trump mask instead? And the response must have been equally simple: great idea, go make it. But in the tradition of simple ideas made on a restricted budget, President Evil is an uneven, occasionally inspired, occasionally woeful movie with a ton of good intentions that don’t always pay off. It begins with an opening credits sequence that replicates the style of Halloween’s own opening credits, but replaces the jack o’ lantern with a Trump mask. 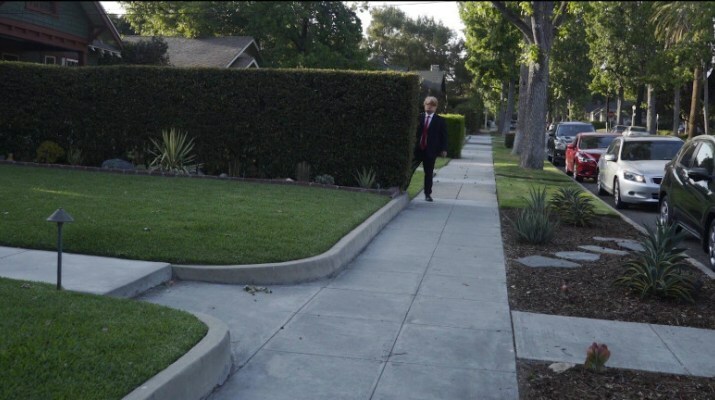 Then there’s an updated recreation of the young Michael Myers’ murder of his sister that is shot entirely from David’s point of view and ends with him being unmasked outside his home. So far, so reassuringly competent homage, though with the kind of comedic elements that reveal the makers’ broader intentions for their story. Nods and winks in the direction of John Carpenter’s seminal movie follow, as well as Easter eggs that reference some of his other movies, while the script also adds further homages from the likes of Psycho (1960) and Young Frankenstein (1974). The comedy is a mixed bag all by itself, and ranges from deft visual flourishes (David’s Trump mask hides someone who looks like Trump), to irritating bouts of frat humour (best summed up by Miles’ popping up at odd moments as characters as varied as a perverted priest and a Jared Kushner look-a-like), and further Mel Brooks’ appropriations (“Be a Smarty and Join the Republican Party”). Like Halloween, there’s a minimum of blood and gore, but there’s a singular lack of tension throughout, and the killings are often poorly staged and framed. The performances are broadly acceptable for this sort of thing, though Attaie does make for an appealing heroine, and Lowry seems more confident when bending the knee to Carpenter’s original than he does with the newer material; it’s as if the obvious difference between them was a given he had no control over. But if there’s one aspect that the script – by Lowry and Gregory P. Wolk – does get right, it’s in depicting the anger and distrust of ethnic minorities in current day America towards the xenophobic attitudes of the predominantly white, privileged political system. The movie is strident in its approach, but is also unapologetic about being so, and on that level – and like the best of horror movies – proves to be a telling reflection of a section of US society’s real fears. 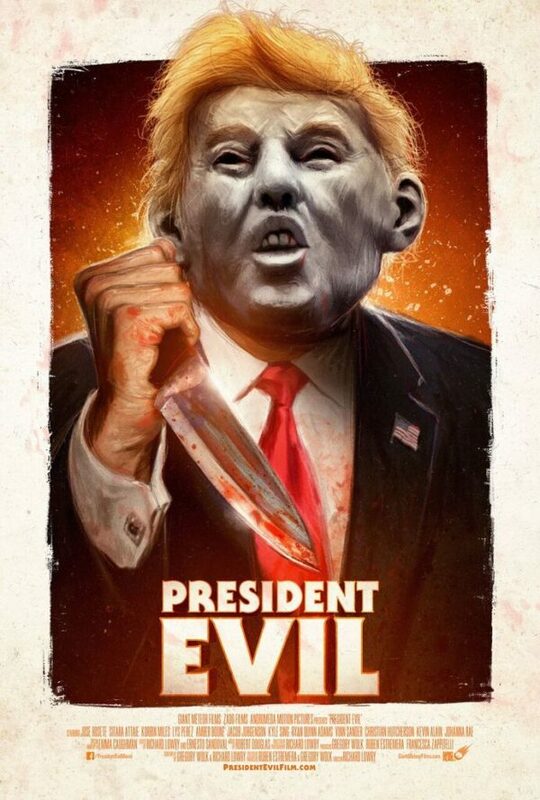 Rating: 5/10 – though there’s much that doesn’t work, and much else that should have been jettisoned at the earliest opportunity, there’s still much to enjoy in President Evil, not the least of which is the way it lampoons Donald Trump and his ill-advised ramblings; to call this a post-millennial horror comedy for post-millennials who believe they might be the last generation able to appreciate something like this, may be stretching things, but when it’s en point, there’s nothing “Fake” about it.